The main aim of the pander R package is to provide a minimal and easy tool for rendering R objects into Pandoc&apos;s markdown. The package is also capable of exporting/converting complex Pandoc documents (reports) in various ways. Regarding the difference between pander and other packages for exporting R objects to different file formats, please refer to this section. Current build and test coverage status: . Or download the sources and build manually. If you&apos;re running R on Windows, you will need to install Rtools. Rcpp to compile certain functions used by the package. and pander can be also very useful inside of knitr. More information about how to use pander and knitr can be found specialized vignette, which can be accessed by vignette(&apos;knitr&apos;, package = &apos;pander&apos;) or available online here. pander heavily builds on Pandoc, which should be pre-installed before trying to convert your reports to different formats. Although main functions work without Pandoc, e.g. you can transform R objects into markdown or generate a markdown formatted report via Pandoc.brew or the custom reference class, but installing that great piece of software is suggested if you want to convert markdown to PDF/docx/HTML or other formats. Starting v0.98.932 RStudio comes with a bundled Pandoc binary, so one can save the tedious steps of installing Pandoc. If you do not have RStudio installed, please refer to the installation process of Pandoc, which is quite straightforward on most-popular operating systems: download and run the binary (a few megabytes), and get a full-blown document converter in a few seconds/minutes. On some Linux distributions, it might be a bit more complicated (as repositories tend to provide out-dated versions of Pandoc, so you would need cabal-install to install from sources). Please do not forget to restart your R session to update your PATH after installation! The package contains numerous helper functions, which render user specified inputs in Pandoc&apos;s markdown format or apply some extra formatting on it. All Pandoc-related functions&apos; names are starting with pandoc. For example pandoc.table is used for rendering tables in markdown. For a technical documentation, see the HTML help files of the package at Rdocumentation. All pandoc functions generally prints to console and do not return anything by default. If you want the opposite, to get markdown in a string, call each function ending in .return, for example pandoc.table.return. For more details, please see the official documentation in e.g. ?pandoc.strong. One of the most popular feature in pander is pandoc.table, rendering most tabular R objects into markdown tables with various options and settings (e.g. style, caption, cell highlighting, cell alignment, width). This section aims to provide quick introduction to most common options, but for more usage/implementation details and examples, please refer to specialized vignette, which can be accessed by vignette(&apos;pandoc_table&apos;) or available online here. Please note that all below features are also supported by the more concise pander generic S3 method! But once again, you should simply stick to the default multiline table format in most cases. Otherwise, it&apos;s wise to update the default table format via panderOptions. Unless permanent option is set for TRUE (by default), caption will be set only for next table. To disable permanently set caption, just call set.caption(NULL) or call set.caption with permanent parameter being set to FALSE. One of the fanciest features in pander is the ease of highlighting rows, columns or any cells in a table. This is a real markdown feature without custom HTML or LaTeX-only tweaks, so all HTML/PDF/MS Word/OpenOffice etc. formats are supported. The emphasize.italics helpers would turn the affected cells to italic, emphasize.strong would apply a bold style to the cell and emphasize.verbatim would apply a verbatim style to the cell. A cell can be also italic, bold and verbatim at the same time. For more examples, please see our "Highlight cells in markdown tables" blog post. Just like with captions, you can also specify the permanent option to be TRUE to update the default cell alignment for all future tables. And beside using set.alignment helper function or passing parameters directly to pandoc.table, you may also set the default alignment styles with panderOptions. keep.line.breaks - allows to preserve line breaks inside cells. Not that by default pandoc.table automatically omits all line breaks found in each table cell to be able to apply the table.split functionality. And please note, that all above mentioned features are also supported by the pander generic S3 method and defaults can be updated via panderOptions for permanent settings. If you think that pander lacks support for any other R class(es), please feel free to open a ticket suggesting a new feature or submit pull request and we will be happy to extend the package. > class(x) <- "I&apos;ve never heard of!" So pander showed a not known class in an (almost) user-friendly way. And we got some warnings too styled with Pandoc footnote! If that document is exported to e.g. HTML or pdf, then the error/warning message could be found on the bottom of the page with a link. Note: there were two warnings in the above call - both captured and returned! Well, this is the feature of Pandoc.brew, see below. > ## Don&apos;t like scientific notation? And of course tables are formatted (e.g. auto add of line breaks, splitting up tables, hyphenation support or markdown format) based on the user specified panderOptions. create somehow a markdown text file (e.g. with brew, knitr or any scripts of yours, maybe with Pandoc.brew - see just below) and transform that to other formats (like HTML, odt, PDF, docx etc.) with Pandoc.convert - similarly to pandoc function in knitr. Basically this is a wrapper around a Pandoc call, which has not much to do with R actually. users might write some reports with literate programming (similar to knitr) in a forked version of brew syntax resulting. This means that the user can include R code chunks in a document, and brewing that results in a pretty Pandoc&apos;s markdown document and also in a bunch of other formats (like HTML, odt, PDF, docx etc.). The great advantage of this function is that you do not have to transform your R objects to markdown manually, it&apos;s all handled automagically. Example: this README.md is cooked with Pandoc.brew based on inst/README.brew and also exported to HTML. Details can be found below or head directly to examples. and users might create a report in a live R session by adding some R objects and paragraphs to a Pandoc reference class object. Details can be found below. slides on "Building a reporting sytem with BREW"
<%= ... %> does pretty much the same but applies pander to the returning R object (instead of cat like the original brew function does). So putting there any R object, it would return in a nice Pandoc&apos;s markdown format with all possible error/warning messages etc. A code chunk block (R commands between the tags) can return any number of values at any part of the block. Plots and images are grabbed in the document, rendered to a png file and pander method would result in a Pandoc markdown formatted image link. This means that the image would be rendered/shown/included in the exported document. All warnings/messages and errors are recorded in the blocks and returned in the document as footnotes or inline messages. All heavy R commands (e.g. those taking more then 0.1 sec to evaluate) are cached so rebrewing a report would not result in a coffee break. Besides this, the custom brew function can do more and also less compared to the original brew package. First of all, the internal caching mechanism of brew has been removed and rewritten for some extra profits besides improved caching. +   Pi equals to `<%= pi %>`. ..$ type  : chr "text"
.. ..$ raw : chr "Pi equals to _3.142_.\nAnd here are some random data:\n"
.. ..$ eval: chr "Pi equals to _3.142_.\nAnd here are some random data:\n"
.. ..$ raw : chr "_3.142_"
.. ..$ eval: chr "_3.142_"
..$ type   : chr "block"
.. ..$ src   : chr "runif(10)"
.. ..$ output: chr "_0.6631_, _0.849_, _0.06986_, _0.3343_, _0.5209_, _0.3471_, _0.866_, _0.05548_, _0.8933_ and _0.2121_"
.. ..$ type  : chr "numeric"
.. ..- attr(*, "class")= chr "evals"
Please check out pdf, docx, odt and other formats by changing the above convert option on your machine, and do not forget to give some feedback! ## You do not want to see the generated report after generation? When working on the rapport package, I really needed some nifty R function that can evaluate R expression along with capturing errors and warnings. Unfortunately the evaluate package had only limited features at that time, as it could not return the raw R object, but only the standard output with messages. So I wrote my own function, and soon some further feature requests arose, like identifying if an R expression results in a plot etc. This section aims to give a quick introduction to the functionality of evals, but for more usage/implementation details, please refer to specialized vignette, which can be accessed by vignette(&apos;evals&apos;, package=&apos;pander&apos;) or available online here.
 " 1  2  3  4  5  6  7  8  9 10"
stdout contains if anything was written to the standard output. Well, this is not a standard histogram usually returned by the hist function, right? As mentioned before, evals have some extra features like applying the user defined theme on various plots automatically. Please see the graphs.brew example above for further details, or check the related global options. If you do not like this feature, simply add evalsOptions(&apos;graph.unify&apos;, FALSE) to your .Rprofile. Further features are described in the technical docs, and now I&apos;ll only give a brief introduction to another important feature of evals. 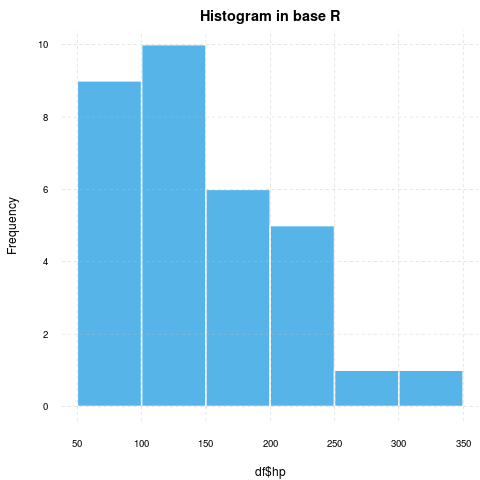 Each passed R chunk is parsed to single R expressions. Each parsed expression&apos;s part (let it be a function, variable, constant etc.) is evaluated (as name) separately to a list. This list describes the unique structure and the content of the passed R expressions. This has some really great benefits (see below). A hash is computed of each list element and cached too in pander&apos;s local environments. This is useful if you are using large data frames, just imagine: the caching algorithm would have to compute the hash for the same data frame each time it&apos;s touched! This way the hash is recomputed only if the R object with the given name is changed. The list of such R objects is serialized, then an SHA-1 hash is computed, which is unique and there is no real risk of collision. If evals can find the cached results in an environment of pander&apos;s namespace (if cache.mode set to enviroment - see below) or in a file named to the computed hash (if cache.mode set to disk), then it is returned on the spot. The objects modified/created by the cached code are also updated. Otherwise the call is evaluated and the results and the modified R objects of the environment are optionally saved to cache (e.g. if cache is active and if the proc.time() of the evaluation is higher then it is defined in cache.time - see details in evals&apos; options). As pander does not cache based on raw sources of chunks and there is no easy way of enabling/disabling caching on a chunk basis, the users have to live with some great advantages and some minor tricky situations - which latter cannot be solved theoretically in my opinion, but I&apos;d love to hear your feedback. Yes, it was returned from cache! It is cached, just run again, you will see. I really think this is a minor issue (with very special coincidences) which cannot be addressed cleverly - but could be avoided with some cautions (e.g. run Pandoc.brew in a clean R session like with Rscript or littler - if you are really afraid of this issue). And after all: you loose nothing, just the cache would not work for that only line and only once in most of the cases. digits: numeric (default: 2) passed to format. Can be a vector specifying values for each column (has to be the same length as number of columns). Values for non-numeric columns will be disregarded. formula.caption.prefix: string (default: Formula:) passed to pandoc.formula to be used as caption prefix. Be sure about what you are doing if changing to other than Formula: or :. round: numeric (default: Inf) passed to round. Can be a vector specifying values for each column (has to be the same length as number of columns). Values for non-numeric columns will be disregarded. missing: string (default: NA) to replace missing values in vectors, tables etc. list.style: &apos;bullet&apos; (default), &apos;ordered&apos; or &apos;roman&apos; passed to pandoc.list. Please not that this has no effect on pander methods. table.split.cells: numeric (default: 30) passed to pandoc.table and also affects pander methods. This option tells pander where to split too wide cells with line breaks. Set `Inf`` to disable. table.caption.prefix: string (default: Table:) passed to pandoc.table to be used as caption prefix. Be sure about what you are doing if changing to other than Table: or :. use.hyphening: boolean (default: FALSE) if try to use hyphening when splitting large cells according to table.split.cells. Requires sylly package. graph.fontfamily: string (default: &apos;sans&apos;) specifying the font family to be used in images. Please note, that using a custom font on Windows requires grDevices:::windowsFonts first. graph.fontsize: numeric (default: 12) specifying the base font size in pixels. Main title is rendered with 1.2 and labels with 0.8 multiplier. graph.panel.background: string (default: &apos;transparent&apos;) specifying the plot&apos;s main panel background. Please note, that this option is not supported with base graphics. graph.colors: character vector of default color palette (defaults to a colorblind theme). Please note that this update work with base plots by appending the col argument to the call if not set. knitr.auto.asis: boolean (default: TRUE) if the results of pander should be considered as asis in knitr. Equals to specifying results=&apos;asis&apos; in the R chunk, so thus there is no need to do so if set to TRUE. Besides localization of numeric formats or the styles of tables, lists and plots, there are some technical options as well, which would effect e.g. caching or the format of rendered image files. You can query/update those with the evalsOptions function as the main backend of pander calls is a custom evaluation function called evals. parse: if TRUE the provided txt elements would be merged into one string and parsed to logical chunks. This is useful if you would want to get separate results of your code parts - not just the last returned value, but you are passing the whole script in one string. To manually lock lines to each other (e.g. calling a plot and on next line adding an abline or text to it), use a plus char (+) at the beginning of each line which should be evaluated with the previous one(s). If set to FALSE, evals would not try to parse R code, it would get evaluated in separate runs - as provided. Please see the documentation of evals. cache.mode: cached results could be stored in an environment in current R session or let it be permanent on disk. cache.dir: path to a directory holding cache files if cache.mode set to disk. Default set to .cache in current working directory. cache.time: number of seconds to limit caching based on proc.time. If set to 0, all R commands, if set to Inf, none is cached (despite the cache parameter). cache.copy.images: copy images to new file names if an image is returned from the disk cache? If set to FALSE (default), the cached path would be returned. classes: a vector or list of classes which should be returned. If set to NULL (by default) all R objects will be returned. hooks: list of hooks to be run for given classes in the form of list(class = fn). If you would also specify some parameters of the function, a list should be provided in the form of list(fn, param1, param2=NULL) etc. So the hooks would become list(class1=list(fn, param1, param2=NULL), ...). See example of evals for more details. A default hook can be specified too by setting the class to &apos;default&apos;. This can be handy if you do not want to define separate methods/functions to each possible class, but automatically apply the default hook to all classes not mentioned in the list. You may also specify only one element in the list like: hooks=list(&apos;default&apos; = pander_return). Please note, that nor error/warning messages, nor stdout is captured (so: updated) while running hooks! length: any R object exceeding the specified length will not be returned. The default value (Inf) does not filter out any R objects. output: a character vector of required returned values. This might be useful if you are only interested in the result, and do not want to save/see e.g. messages or printed output. See examples of evals. graph.name: set the file name of saved plots which is %s by default. A simple character string might be provided where %d would be replaced by the index of the generating txt source, %n with an incremented integer in graph.dir with similar file names and %t by some unique random characters. When used in a brew file, %i is also available which would be replaced by the chunk number. graph.dir: path to a directory where to place generated images. If the directory does not exist, evals try to create that. Default set to plots in current working directory. graph.output: set the required file format of saved plots. Currently it could be any of grDevices: png, bmp, jpeg, jpg, tiff, svg or pdf. Set to NA not to save plots at all and tweak that setting with capture.plot() on demand. res: nominal resolution in ppi. The height and width of vector images will be calculated based in this. hi.res: generate high resolution plots also? If set to TRUE, each R code parts resulting an image would be run twice. hi.res.width: width of generated high resolution plot in pixels for even vector formats. The height and res of high resolution image is automatically computed based on the above options to preserve original plot aspect ratio. graph.env: save the environments in which plots were generated to distinct files (based on graph.name) with env extension? graph.recordplot: save the plot via recordPlot to distinct files (based on graph.name) with recodplot extension? graph.RDS save the raw R object returned (usually with lattice or ggplot2) while generating the plots to distinct files (based on graph.name) with RDS extension? log: NULL or an optionally passed logger name from futile.logger to record all info, trace, debug and error messages. How does pander differ from Sweave, brew, knitr, R2HTML and the other tools of literate programming? First of all pander can be used as a helper with any other literate programming solution, so you can call pander inside of knitr chunks. But if you stick with pander&apos;s literate programming engine, then there&apos;s not much need for calling ascii, xtable, Hmisc, tables etc. or even pander in the R command chunks to transform R objects into markdown, HTML, tex etc. as Pandoc.brew automatically results in Pandoc&apos;s markdown, which can be converted to almost any text document format. Conversion can be done automatically after calling pander reporting functions (Pander.brew or Pandoc). Based on the fact that pander transforms R objects into markdown, no "traditional" R console output is shown in the resulting document (nor in markdown, nor in exported docs), but all R objects are transformed to tables, list etc. Well, there is an option (show.src) to show the original R commands before the formatted output, and pander calls can be also easily tweaked to return the printed version of the R objects - if you would need that in some strange situation - like writing an R tutorial. But really think that nor R code, nor raw R results have anything to do with an exported report. Of course all warnings, messages and errors are captured while evaluating R expressions just like stdout besides the raw R objects. So the resulting report also includes the raw R objects for further edits if needed - which is a very unique feature. Graphs and plots are automatically identified in code chunks and saved to disk in a png file linked in the resulting document. This means that if you create a report (e.g. brew a text file) and export it to PDF/docx etc. all the plots/images would be there. There are some parameters to specify the resolution of the image and also the type (e.g. jpg, svg or pdf) besides a wide variety of theme options. About the latter, please check the graphs.brew example above. I have created some simple LISP functions which would be handy if you are using the best damn IDE for R. These functions and default key-bindings are shipped with the package, feel free to personalize. pander-brew (C-c p b): Run Pandoc.brew on current buffer or region (if mark is active), show results in ess-output and (optionally) copy results to clipboard while setting working directory to tempdir() temporary. pander-brew-export (C-c p B): Run Pandoc.brew on current buffer or region (if mark is active) and export results to specified (auto-complete in minibuffer) format. Also tries to open exported document. pander-eval (C-c p e): Run pander on (automatically evaluated) region or current chunk (if marker is not set), show results (of last returned R object) in *ess-output* and (optionally) copy those to clipboard while setting working directory to tempdir() temporary. pander-clipboard: If non-nil then the result of pander-* functions would be copied to clipboard. pander-show-source: If non-nil then the source of R commands would also show up in generated documents while running &apos;pander-eval&apos;. This would not affect brew functions ATM. To use this small lib, just type: M-x pander-mode on any document. It might be useful to add a hook to markdown-mode if you find this useful. pander.Arima Prints an arima object from stats package in Pandoc's markdown. pander.Glm Prints an Grm object from rms package in Pandoc's markdown. pander.cph Prints an cph object from rms package in Pandoc's markdown. pander.ets Prints an ets object from forecast package in Pandoc's markdown. pander.nls Prints an nls object from stats package in Pandoc's markdown. pander.ols Prints an ols object from rms package in Pandoc's markdown. pander.orm Prints an orm object from rms package in Pandoc's markdown. pander.summary.rms Prints an summary.rms from rms package in Pandoc's markdown. pandoc.link.return Create pandoc link Pandoc's markdown format link. pander.summary.survreg Prints an survreg object from survival package in Pandoc's markdown. pander.polr Prints an polr object from MASS package in Pandoc's markdown. pander.summary.polr Prints an summary.polr object from MASS package in Pandoc's markdown. pander.irts Prints an irts object from tseries package in Pandoc's markdown. pander.lrm Prints an lrm object from rms package in Pandoc's markdown. pander.summary.manova Prints an summary.manova object from stats package in Pandoc's markdown. pander.summary.nls Prints an summary.nls object from stats package in Pandoc's markdown. redrawPlot Redraw a recordedplot, grid, trellis, or ggplot2 plot. pander.survreg Prints an survreg object from survival package in Pandoc's markdown. SystemRequirements pandoc (http://johnmacfarlane.net/pandoc) for exporting markdown files to other formats.